Energy efficiency is, hands-down, the most effective way for us to get to a low or no carbon future. 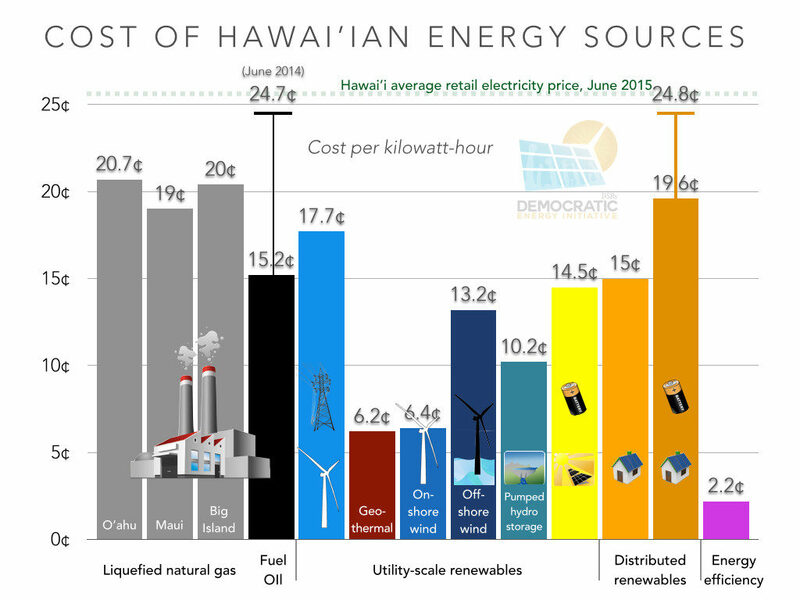 According to an analysis by the Institute for Local Self-Reliance (see above), it’s the absolute cheapest source of energy, by a 3 to 1 margin, that we can explore. It’s (relatively) easy, it’s inexpensive, and the technology is proven and effective already. Yet the industry remains nascent. Part of the challenge is that people are unaware of the opportunities. In terms of greening a home, people think solar first, mainly because solar advertising dwarfs efficiency advertising (Note, I don’t have any data on this, but when was the last time you saw a solar ad? how about an efficiency ad? I rest my case!). In addition, thanks to power purchase agreements (PPA), people can get “free” solar, with no money down. For a fraction of the cost of solar energy, people can simply reduce their energy use instead of replacing coal with solar to power their home. They may not realize that, in the long run, they’re still paying for the solar project, which may run $25,000 – $50,000, whereas an investment in making their home more energy efficient may cost much less than that and yield a payback period of under a year, depending on your local electric rates. Another part of the problem is that perspective entrepreneurs don’t see good enough ROI. According to an interview I conducted with Thomas Hand, a former energy efficiency entrepreneur (a company called Hand Energy Services), the margins are not good, and scaling is exceptionally difficult. Hand said that he shut the company down in 2014 after 6 years in business because costs were high, inventory management was difficult, and recordkeeping was a job in itself. As an energy efficiency entrepreneur myself, I have interviewed dozens of people in Hand’s position…smart, dedicated people who saw the low-hanging fruit in energy efficiency, hung up a shingle and gave it their best, but ultimately folded or pivoted their companies. I’ve interviewed these people to learn what works, what doesn’t, what challenges they faced, and what decisions they made along the way. I’ve been doing energy efficiency for 2.5 years, and our company is growing nicely. I’ve tried to incorporate as many of the lessons of those who’ve gone before me into our business model, and I believe I’ve found a model that is scaleable, effective, and profitable. There were several keys to this. The first is touch. I’d describe our company as “light touch”. Whereas many efficiency providers do expensive energy audits and follow up with large scale insulation jobs, we focus mostly on “inside the building envelop” work: LED lights, high efficiency fixtures, appliance work, and education of residents. We try to identify insulation needs and other large invoice work, but rather than getting haz-mat certified to install spray foam insulation, and carrying around a lot of product and heavy installation equipment, we just send referrals out to contractors for that kind of work. This “small invoice” approach is nontraditional. Traditional logic says “large invoice” means less customer acquisition costs per customer, and therefore higher margins. But the ease of adoption helps make up the gap, and we’ve found a nice niche. The other major key to our success is our mobile software. Scaling beyond the company founders is always one of the hardest steps in a company’s evolution, but our service software allows technicians to do a job on site in a foolproof manner–a simple checklist with required fields makes it such that a technician can’t forget something important. They can save data throughout the service, so that if something in the IT world goes bonk, all is not lost. Inventory that is installed/sold gets accumulated and tracked and individual technicians’ inventory can be resupplied automatically. Customers get reports with the data we want them to see, and none that we don’t. We can automatically send a customized report to a renter and a completely different report from the same service to the homeowner or business owner. 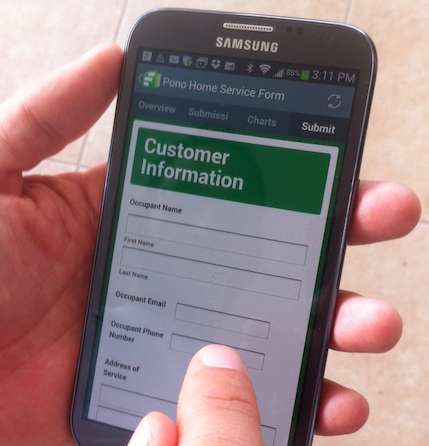 All our data is stored in the cloud so we can pull up reports any time someone calls to inquire about their service. We can upload electric bills and water bills for later measurement and verification analyses, and store them in the cloud. We can show people how much they’ll save with any given LED bulb or other offering we have, right when they are at the point of purchase, which we’ve seen is an exceptionally powerful marketing tool. We can take a signature from a customer, invoice them, and charge them for the work right there on the spot. I honestly don’t know how a company that works in the field could operate without this type of tool anymore. It keeps our costs low and our productivity high, and customers are generally impressed with it, which adds a layer of credibility and professionalism to our service. Perhaps one of the most important aspects of having a great mobile technology solution is that companies looking to impress larger commercial customers will need to be able to show that they have all these capabilities and more. Mobile software allows for impressive looking bids, audits, proposals, and reports. We’ve been able to secure contracts with several larger scale companies, and those would never have happened had we not been able to show them some high tech wizardry. Scott Cooney was the 2015 runner-up for the Hawaii Venture Capital Association Clean Tech Entrepreneur of the Year. He is the founder and CEO of Pono Home, a Honolulu-based energy efficiency company that has been chosen for multiple clean tech incubator cohorts, and aspires to help people start green businesses to create a better economy. See the analysis of energy efficiency by the Institute for Local Self-Reliance here. Photos courtesy of CleanTechnica and Mobile Solutions.